Greek, Etruscan, & Roman Bronzes (MFA), no. 501; Sculpture in Stone and Bronze (MFA), p. 125 (additional published references). The pendant is in two parts: three “S”-shaped hooks, two above and one below a flower petal (inverted) with loops. 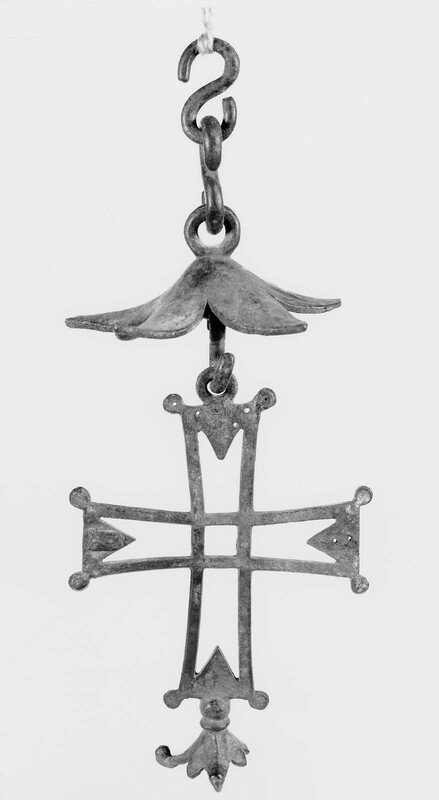 The cross hooks onto the lower “S” and has, in turn, its own eye for a hook at the bottom. Attachments to surface of cross now missing. One petal of flower suspended at bottom of cross now broken away. Green patina.